The 'Rendez-Vous Rive Gauche' 70 carré (by Cyrille Diatkine) was first released in 2010, in celebration of the opening of Hermès' first left bank boutique, in the Rue de Sevrès. This year, the design has been re-issued in several CWs for the SS2012 collection. Mine is a much cherished gift from a dear and wonderful friend, and I adore the marine/turquoise/caramel (it has a white contrast hem) she picked for me. The scarf isn't the souvenir I brought home, but it had a big influence on something else that I did bring back! 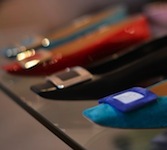 On the Rue Faubourg Saint-Honoré, the Roger Vivier boutique is just a minute's walk from Hermès. After taking the photos of the current H window displays, I went across the road to admire the beautiful spring offerings at RV. The tri-colored Belle Viviers reminded me so much of the Rendez-vous scarf I was wearing, both in color and spirit. Both seemed to have been made for each other.. The scarf carries wonderful memories of spending time with my friend, and reminds me also of the many happy times spent in the charming left bank quarters of Paris. 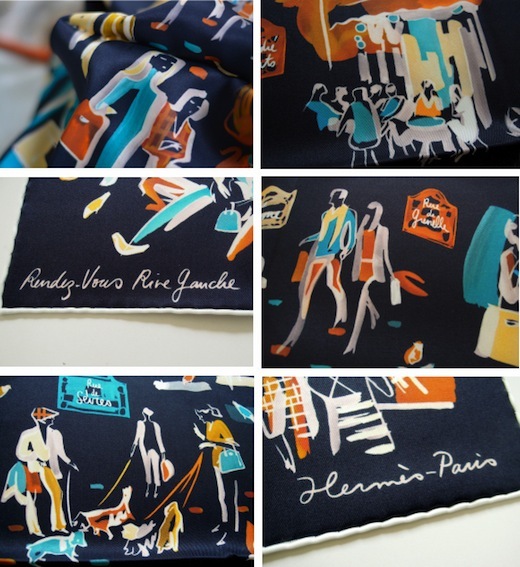 The vignettes depict 'la vie quotidienne' ... you see friends meeting for coffee, people walking their dogs, lovers in a park and waiters preparing their tables for lunch.... and there are plenty of Hermès scarves and bags to be discovered too. The design even shows my friend and me walking together, or at least that's what we both 'see'. The new shoes quickly made friends with several scarves in the drawer and staples in the wardrobe, here with my much loved 'Monsieur et Madame' 90 carré. Your taste is as always impeccable and the shoes and scarf are so beautiful. I love the way you combine your belongings. To see how new items work with existing ones is always so much fun and joy... and the Belles seem to be particularly good at making new friends! An schwarz/rot/gold hatte ich gar nicht gedacht... was für eine nette Idee, liebe happyface! Thank you so much, dear Jane. It truly has been a wonderful week in every way. Just beautiful! Such a lovely pairing--the shoes, bag and scarf. Such a sweet little story behind the scarf, making it all the more special. 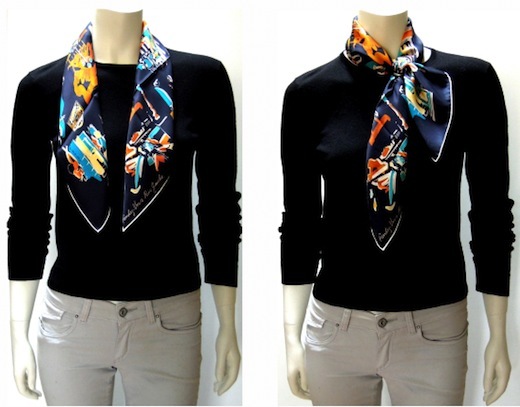 Oh, your scarf and Roger Vivier shoes are both so beautiful! Fabulous colors!! What a lovely scarf. I have the slightly similar les parisiennes and just love the little people on it. My scarves that I purchased on holiday are my favourites, as they remind one of lovely time away. Oh the Les Parisiennes is such a fun and fabulous design, and of course a perfect souvenir from the city of lights. So nice to be scarf 'cousins' with you! What a wonderful scarf our friend picked out for you! There is a lot of meaning and sentiment in the giving and receiving of H scarves. I once went on an extended trip and my mom slung her h scarf around my neck and told me it would bring us luck and safe returns. Your shoes are elegant and such a great neutral. Do RV shoes typically have leather soles? How do they fit. Thank you for sharing these wonderful additions to your wardrobe! Thank you for sharing this lovely story about your mother, how special it must have been to feel her love and protection through the silk you were wearing! The RVs I own (Belle Vivier 25 and 45, and Marlène 45) all have leather soles. The fit is fantastic (my feet are narrow), I find them unbelievably comfortable. Be careful with the sizes though, I need different ones in the various models.. in the Marlène it's a full size up from the 25mm Belle Viviers. Typo : I meant your friend. Sorry...typing on the iPad. Mai Tai, as usual, your taste is impeccable! I must admit, I'm going to copy...I'll be in Paris in the Spring and I must have those very Roger Vivier shoes! On another note, I have purchase 2 of your scarf rings, to date, and I couldn't be more pleased with the transactions. Speedy delivery, beautifully wrapped with care, and premier quality scarf rings. I am SO happy to have found you, and this blog!! So happy you enjoy the scarf rings (and blog posts), many thanks for the lovely feedback! Wishing you the best of luck finding the Belles.. hope we'll be 'shoe twins' soon. Have fun planning your trip! I love your new colorful RV's. That style is my favorite and my gray patent 45mm get compliments every time I wear them. I think it's the silver metallic angled heel. Very distinct and so well made. Look forward to seeing them appear in future posts. Oh I can imagine how stunning the grey must be with the silver heel! Love all the angled heels too, they make for such a chic and understated look. hi there - I am a new fun of your terrific blog. Love the scarf ideas and very much enjoyed your informative piece on cashmere. I have a question about your basics. Where do you get such nice cut , simple black cashmere tops? plain quality white shirts without frou frou? I find they are hard to come by...Any tips much appreciated. A warm welcome to you, dear sophié! Re your question, I don't favor any particular brand, and most of my sweaters are mixed materials. The sweater above (a very light cashmere) is by agnes b, where I often find good basics. Anne Fontaine does wonderful shirts, and the quality is great. I particularly like the ones with jersey sleeves and backs, they are ideal to go underneath a cardigan or sweater. Other places I often find good sweaters are Comptoirs et Cotonniers, H&M, Un..deux.. trois, The Kooples, Sandro, Tara Jarmon and John Smedley, to name a few. And my local market ;-) Hope this helps.